Astronomers have unveiled an unprecedented new atlas of the inner regions of the Milky Way, our home galaxy, peppered with thousands of previously undiscovered dense knots of cold cosmic dust — the potential birthplaces of new stars. Made using observations from the APEX telescope in Chile, this survey is the largest map of cold dust so far, and will prove an invaluable map for observations made with the forthcoming ALMA telescope, as well as the recently launched ESA Herschel space telescope. 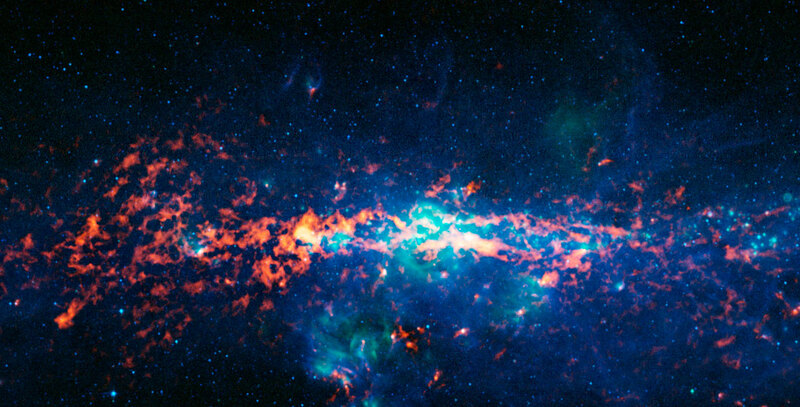 This new guide for astronomers, known as the APEX Telescope Large Area Survey of the Galaxy (ATLASGAL) shows the Milky Way in submillimetre-wavelength light (between infrared light and radio waves ). Images of the cosmos at these wavelengths are vital for studying the birthplaces of new stars and the structure of the crowded galactic core. “ATLASGAL gives us a new look at the Milky Way. Not only will it help us investigate how massive stars form, but it will also give us an overview of the larger-scale structure of our galaxy”, said Frederic Schuller from the Max Planck Institute for Radio Astronomy, leader of the ATLASGAL team. The area of the new submillimetre map is approximately 95 square degrees, covering a very long and narrow strip along the galactic plane two degrees wide (four times the width of the full Moon) and over 40 degrees long. The 16 000 pixel-long map was made with the LABOCA submillimetre-wave camera on the ESO-operated APEX telescope. APEX is located at an altitude of 5100 m on the arid plateau of Chajnantor in the Chilean Andes — a site that allows optimal viewing in the submillimetre range. The Universe is relatively unexplored at submillimetre wavelengths, as extremely dry atmospheric conditions and advanced detector technology are required for such observations. The interstellar medium — the material between the stars — is composed of gas and grains of cosmic dust, rather like fine sand or soot. However, the gas is mostly hydrogen and relatively difficult to detect, so astronomers often search for these dense regions by looking for the faint heat glow of the cosmic dust grains. Submillimetre light allows astronomers to see these dust clouds shining, even though they obscure our view of the Universe at visible light wavelengths. Accordingly, the ATLASGAL map includes the denser central regions of our galaxy, in the direction of the constellation of Sagittarius — home to a supermassive black hole (eso0846) — that are otherwise hidden behind a dark shroud of dust clouds. The newly released map also reveals thousands of dense dust clumps, many never seen before, which mark the future birthplaces of massive stars. The clumps are typically a couple of light-years in size, and have masses of between ten and a few thousand times the mass of our Sun. In addition, ATLASGAL has captured images of beautiful filamentary structures and bubbles in the interstellar medium, blown by supernovae and the winds of bright stars. Some striking highlights of the map include the centre of the Milky Way, the nearby massive and dense cloud of molecular gas called Sagittarius B2, and a bubble of expanding gas called RCW120, where the interstellar medium around the bubble is collapsing and forming new stars (see eso0840). “It’s exciting to get our first look at ATLASGAL, and we will be increasing the size of the map over the next year to cover all of the galactic plane visible from the APEX site on Chajnantor, as well as combining it with infrared observations to be made by the ESA Herschel Space Observatory. We look forward to new discoveries made with these maps, which will also serve as a guide for future observations with ALMA”, said Leonardo Testi from ESO, who is a member of the ATLASGAL team and the European Project Scientist for the ALMA project. The map was constructed from individual APEX observations in radiation at 870 µm (0.87 mm) wavelength. The ATLASGAL observations are presented in a paper by Frederic Schuller et al., ATLASGAL — The APEX Telescope Large Area Survey of the Galaxy at 870 µm, published in Astronomy & Astrophysics. ATLASGAL is a collaboration between the Max Planck Institute for Radio Astronomy, the Max Planck Institute for Astronomy, ESO, and the University of Chile. LABOCA (Large APEX Bolometer Camera), one of APEX’s major instruments, is the world’s largest bolometer camera (a “thermometer camera”, or thermal camera that measures and maps the tiny changes in temperature that occur when sub-millimetre wavelength light falls on its absorbing surface; see (eso0735). LABOCA’s large field of view and high sensitivity make it an invaluable tool for imaging the “cold Universe”. LABOCA was built by the Max Planck Institute for Radio Astronomy. The Atacama Pathfinder Experiment (APEX) telescope is a 12-metre telescope, located at 5100 m altitude on the arid plateau of Chajnantor in the Chilean Andes. APEX operates at millimetre and submillimetre wavelengths. This wavelength range is a relatively unexplored frontier in astronomy, requiring advanced detectors and an extremely high and dry observatory site, such as Chajnantor. APEX, the largest submillimetre-wave telescope operating in the southern hemisphere, is a collaboration between the Max Planck Institute for Radio Astronomy, the Onsala Space Observatory and ESO. Operation of APEX at Chajnantor is entrusted to ESO. APEX is a “pathfinder” for ALMA — it is based on a prototype antenna constructed for the ALMA project, it is located on the same plateau and will find many targets that ALMA will be able to study in extreme detail. The Atacama Large Millimeter/submillimeter Array (ALMA), an international astronomy facility, is a partnership of Europe, North America and East Asia in cooperation with the Republic of Chile. ESO is the European partner in ALMA. ALMA, the largest astronomical project in existence, is a revolutionary telescope, comprising an array of 66 giant 12-metre and 7-metre diameter antennas observing at millimetre and submillimetre wavelengths. ALMA will start scientific observations in 2011. See the associated full article here. ESO, European Southern Observatory, builds and operates a suite of the world’s most advanced ground-based astronomical telescopes.